Most often used as a photo chase aircraft, the Beech T-34C was used in some research as well. 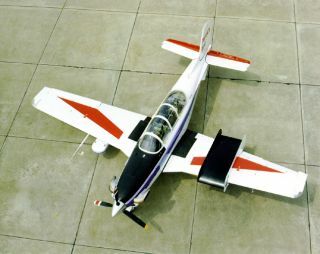 In this historical photo from the U.S. space agency, the Beech T-34C Turbo Mentor, while most often flown as a photo chase aircraft, has performed research itself, notably with a laminar flow gloved wing. The aircraft, seen here in June of 1978, is equipped with a luggage pod under its starboard wing. In 1989, the T-34 was used to sample Space Shuttle exhaust during mission STS-34.